You may think you’re a fear-defying thrill lover, but can you handle the ultimate heart-pounding experience? Find out in Cape Town by cage diving with great white sharks. 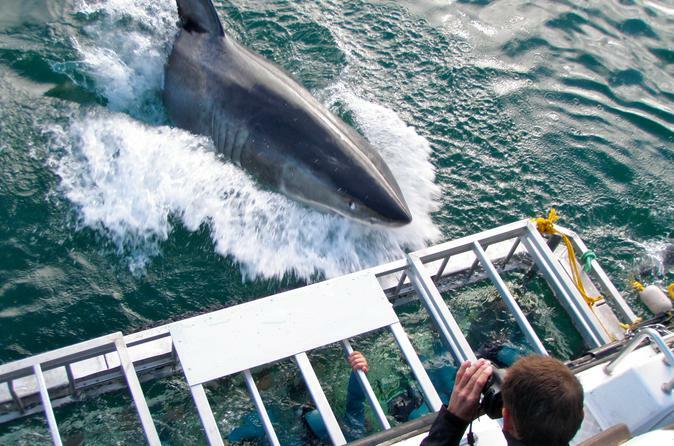 This full-day shark-diving experience takes you out into the open ocean off the shore of Gansbaai and puts you within touching distance of one of the world’s most feared predators. Before jumping in, you'll learn about the sharks from the onboard marine biologist and expert guides. Upgrade to include round-trip transport between your Cape Town hotel and Gansbaai. Breakfast and snacks are included. Experience an up, close and personal encounter with the ‘gentle giants’ of the ocean that promises to be an ‘experience to be treasured.’ From June to December you will mostly encounter the Southern Right whales, seals, penguins and marine birds, and often see dolphins, Bryde’s and Humpback whales on this informative and educational tour. 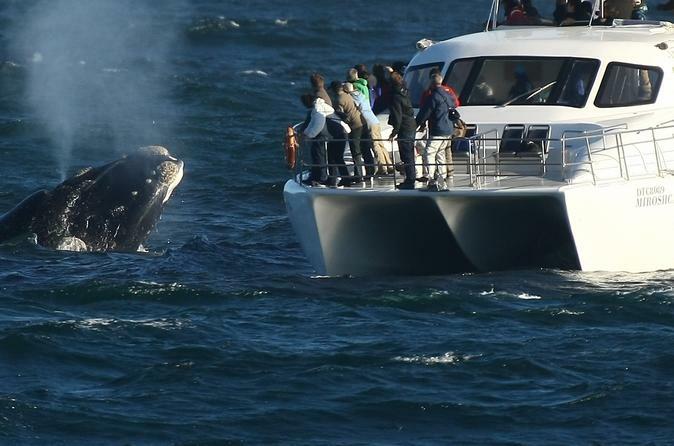 Boat based Whale Watching provides a safe, fun filled and unforgettable close-up viewing experience of the seasonal breeding and calving behaviors of the Southern Right Whale (Eubalaena australis) in Walker Bay, Hermanus, South Africa. Whale watching between June and December. Hermanus is a 90min drive from Cape Town. Your professional team will take you on a diving adventure that you will never forget. The trip starts anything between 07h00 and 12h00 in the morning in Kleinbaai, which is 2 km along the coast from the village of Gansbaai. Here you board the shark-chaser - Apex Predator. Once onboard, it is a 5 mile voyage to Dyer Island. 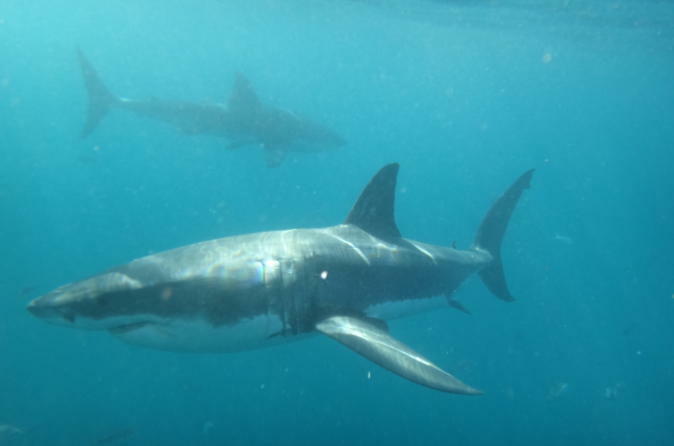 There are only eight operators who have permits to undertake Great White Shark Cage Diving in order to attract great white sharks issued by the Republic of South Africa's Department of Environmental Affairs and Tourism of which this is one. 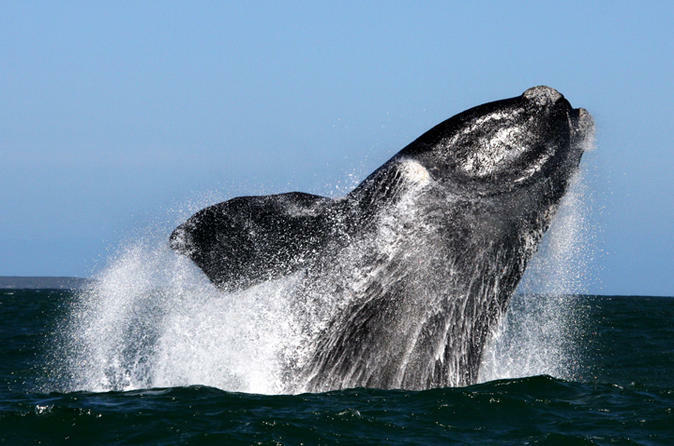 Jump on board for a spectacular 2-hour whale watching experience along the cliffs of De Keldar. 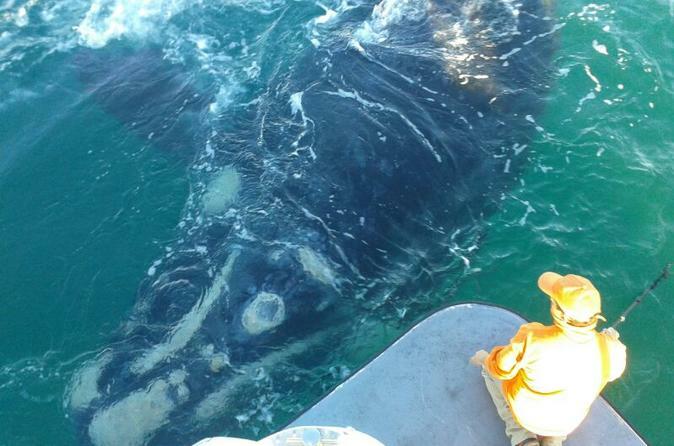 Watch Southern right whales and other marine life as they swim amongst you. Enjoy the experience in full, as the boat is never overcrowded for the best experience. Descend into the blue waters of Gansbaai, a hotspot for the Great White Shark, on a heart-pounding experience, just for your sole group. 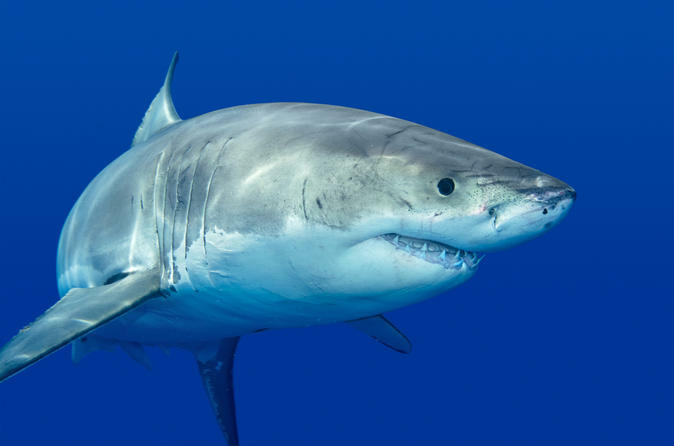 This private shark dive is the perfect thrill-seeking treat for anyone looking to get close-up to one of the world’s most fearsome predators: the great white shark. Learn about the species from an onboard marine biologist and then spend time in the water with the sharks protected by a cage. Upgrade to include round-trip transport between your Cape Town hotel and Gansbaai. Food and drinks included. 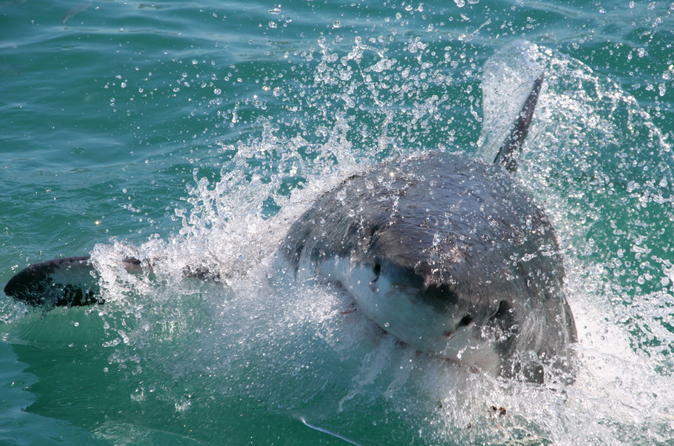 In South Africa, we are privileged to have access to great white sharks … if you know where to go, and when. Shark Cage Diving and viewing is a unique and niche experience. Exceptional professional and personalised service coupled with extensive industry knowledge make this the ideal choice for an once-in-a-lifetime experience that will captivate your imagination! 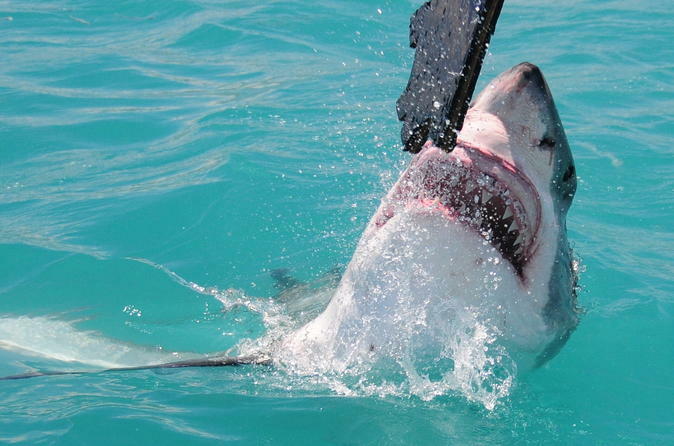 Meet the Great White shark in Gansbaai - The shark cage diving capital of South Africa. No diving experience required, 100% Safe.